Backup Skype settings and chat history is a crucial way to restore the default level of social or business activity after any significant changes in hardware or security problems occurs. Handy Backup allows fast Skype backup via the “Computer” feature. What to Back Up in Skype? Archived voice calls (if any). Because online audio-streamed dialogs in Skype are highly volatile, this is only one way to back up and recall it: by capturing the audio stream to some popular audio format, such as MP3 or WAV, with performing Skype calls backup using these files. Note: From version to version, some Skype backup data may be stored on a Skype server instead of the local machine. In these cases, the Skype policy may alter, reduce or restrict the backup Skype strategy. How to Backup Skype Chat History? This is another principal question. To backup Skype history in Windows 7 or under most other Windows editions, find the file called main.db in the Skype setting folder. Backing this folder up, you are also performing backup of Skype chat history. How frequently to backup Skype is completely a matter of taste and personal need, but as chats are sharing the volatility with other types of talks, we recommend to backup Skype chat history as frequently as possible, perhaps no less than once per day. To back up Skype Data you need any edition starting with Handy Backup Standard. 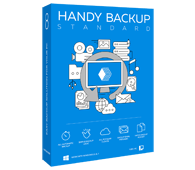 If you want to save your contacts, settings or chat history then Handy Backup Standard is a perfect solution for you. Free 30-days trial version! To backup Skype contacts and settings with Handy Backup, please follow this instruction. Start Handy Backup and create a new task by selecting "New task" from menu or by clicking on a button on the management panel. Select a backup task. On a Step 2, select the “Computer” option as a data source. Note: To backup Skype chat history, check that Skype conversation file called main.db is present in one of these folders. If you have also an archive of voice calls in some audio format, please select the folder where you are storing these files and include it in a backup set, too. Now you can select a destination for your backup, set compression or encryption actions, schedule your backup task and make other steps for completing the Skype backup action. 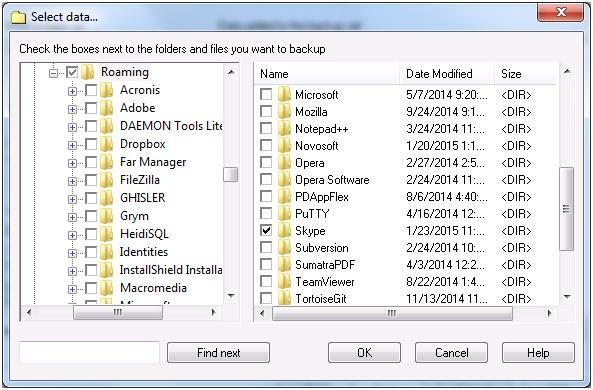 These steps are not specific for backup Skype; any backup task may be tuned in this way. Name your Skype backup task. You may run it manually any time you need it, or call to scheduled sequence of task running. Hi.. I overcome the below issue(i.e.,main.db locked while skype is running) by a workaround, using your "Action Before/After" tab, where a bat script to kill skype was written, before taking a backup, and a bat script to start the skype back, after taking the backup. That tab helped me :-) ..thanks!! We are glad to see you are using our software with such a skill and creativity:). Your solution is an excellent example of versatile application of Handy Backup features. To avoid the obstacle you described, we are also recommending running the program as the administrator with full rights and privileges in Windows: Right click on the program's shortcut or an .exe file and click on “Run as administrator”. Then create New Task and try to back up your data. Unfortunately, not all of the windows folders can be accessed simultaneously even by the administrator. Try to grant access to these secured folders using the sequence of control elements: Right Click - Properties -Security - add permissions to user and program. This way, you may set permissions to any particular folder to be backed up by Handy Backup automatically. Good Tool..! !..But problem is main.db is locked while skype is logged on(i.e., skype process is running), and as a result scheduled backup fails; An e.g: ".. STATUS:>01:05:54 Backing up file "main.db"... ERROR:> 01:05:54 Error occurred while reading the file: The handle is invalid (0x00000006) WARNING:>01:05:54 The error is ignored. STATUS:>01:05:54 *** Operation Summary *** ERROR:> 01:05:54 Status : FAILED. STATUS:>01:05:54 Errors ignored : 1 STATUS:>01:05:54 Files backed up : 0 .."